This post is in response to a question asked here. As with all fat burning initiatives, making your stomach flat has to be done with a combination of planned exercise and a meticulous diet. Sure you can subscribe to the plethora of diet advertising present in modern day media, but at the end of the day you cannot best hard work. A great resource for achieving flat stomachs can be found here if you desire to get a second opinion – but let’s read on! First, it may be useful for you to understand where your weight is with respect to others of your demographic. Follow this link for Average Weight Statistics. It is clear from our parent website that average weight varies drastically due to differing geographies, as well as individual height; You must keep this in the back of your mind as we go forward. For a typical North American man, the average weight is somewhere around 175-190 lbs and 155-170 lbs for females. You can’t underestimate the power of running. If you have knee problems or foot problems, try utilizing an elliptical machine at your nearest gym. Running has the ability to burn calories, topping virtually all other exercises in this category. The methodical motion and demanding core-strength environment will have you shaping your stomach in no time. For a great running workout guide, visit here. Step 1 - Lie with your back flat on the floor, preferably with a mat under you for increased comfort. You may place your hands behind your head for additional support – this tends to take stress off of the lower back. Step 2 - Bring your upper back off the floor and begin to crunch your abdominal muscles. Carry this motion forward. Pro-Tip: Feel free to place some weight on your toes (or get a partner to step on them) as you start out – this will ease the transition of the exercise. Step 3 - Bring the sit-up close to your thighs. If you begin to feel back pain, only complete until Step 2 before returning to a flat position. Remember to take it easy at first and build your strength into the exercise – perhaps start out with 3x sets of 10-20 reps once per day. 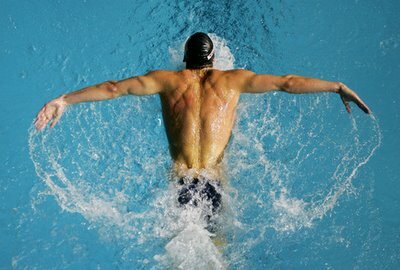 Believe it or not, swimming is an incredible work-out for a large variety of muscles all over your body. Swimming has the power to lengthen and tone your muscles, while burning a significant amount of calories. There are a number of swimming strokes appropriate, namely: Front Crawl, Breast Stroke and Back Crawl. Your local Community Centre should have hours posted for public swim – take advantage of these, or join your local gym! As was stated before, it’s important to maintain a healthy diet as well! Stay away from sweets, increase your intake of fluids (mainly water), fruits and vegetables. Follow these steps and you’ll be on your way to a flatter stomach in no time! Until next time, take care! This entry was posted in Exercise by admin. Bookmark the permalink.